Cook the lobster in boiling water for 20 minutes. Let cool. With a carving spoon, prepare small balls of the turnips, carrots and zucchini. Cook for 3 to 5 minutes in salted water. Cut the lobster, keeping the claws in full and cutting the tail in 2 or 3 pieces. Sauté the shallots and leeks in butter and olive oil. 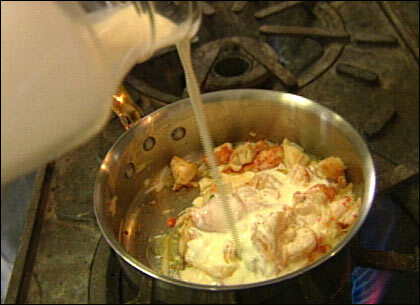 Add the lobster and heavy cream. The sauce should be a little thick. Season with salt and pepper. Heat for two minutes and remove the lobster. 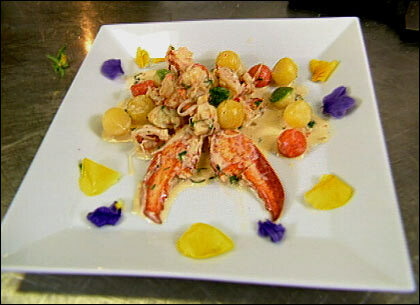 Heat the vegetables in the cream and add the lobster. Sprinkle with chervil and serve. This segment appears in show #2817.